Description: This terrestrial orchid develops a single basal leaf during the fall that persists through the winter until the flowering period beginning in late spring. This basal leaf is 3½-8" long and 1-3" across; it is broadly elliptic or oblong-ovate in shape and smooth along the margins. The orientation of the basal leaf is ascending to horizontal with the ground. The upper leaf surface is dark green with fine white veins and glabrous; the veins are parallel to each other. The lower leaf surface is green, purplish green, or dull purple. 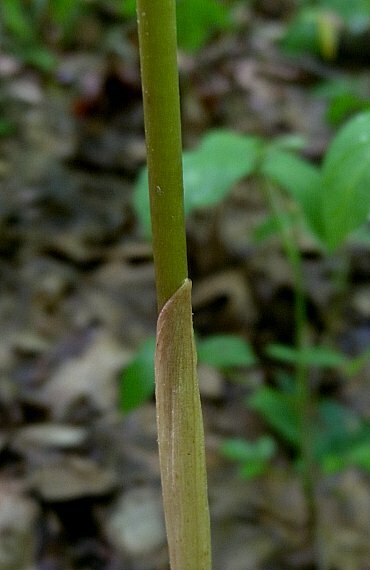 At the base of the leaf, there is a short petiole that pokes above the ground surface. This basal leaf originates from the oldest corm of the root system. 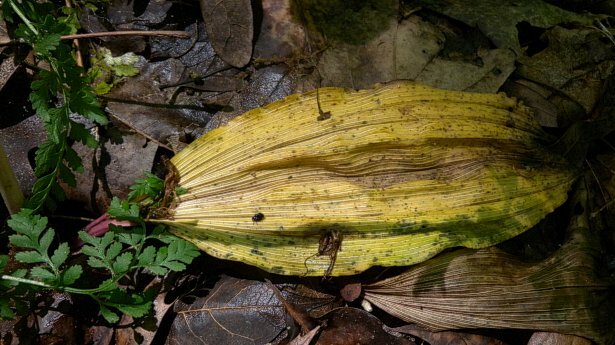 During the late spring or early summer, the basal leaf withers away and a raceme of flowers about 6-20" tall is sometimes produced. Each raceme will have about 8-16 flowers; they are laxly distributed along the flowering stalk. A large majority of plants fail to produce flowers during any given year, either because they are too small and immature, or environmental conditions are unfavorable. The flowering stalk is pale green or pale purplish green, terete, and glabrous; it is surrounded by a tight basal sheath toward its base. The flowers are about ¾-1" long and a little less across, consisting of 3 sepals, 3 petals, and the reproductive organs; nectar spurs are lacking. The sepals spread outward from the center of the flower to a greater or lesser degree, and they are more or less equally spaced from each other. These sepals are narrowly oblanceolate or narrowly oblong, pale green or pale yellow, becoming purplish toward their tips. The two upper petals are narrowly oblanceolate or narrowly oblong and colored similarly to the sepals; these petals are adjacent to each other, functioning as a protective hood over the reproductive organs. The lower petal is the lip of the flower; it is oblanceolate or obovate and primarily white with speckles of purple or magenta. The lip is depressed in its center and its margins are elevated and undulate. The relatively stout pedicels of the flowers are about ¾" long, while the floral bracts are less than ¼" long and early-deciduous. The blooming period lasts about 2-3 weeks (late spring to early summer) and the flowers lack noticeable fragrance. In the absence of insect pollination, they are self-fertile. Afterwards, the flowers are replaced by seed capsules about ¾-1" long that are broadly ellipsoid in shape with multiple narrow ridges along their sides. These capsules nod downward from their pedicels along the raceme; later in the year, they split open to release abundant tiny seeds. These seeds are easily distributed to new areas via wind currents. The root system consists of 1-4 bulbous corms that are connected by slender rhizomes. These corms are up to 1" across and individually they can persist for 2 years. On a healthy plant, a new corm is produced each year. Fibrous roots originate from the bases of the corms. Small colonies of clonal plants can develop from the spread of these corms. Cultivation: The preference is dappled sunlight during the fall, winter, and spring; light levels during the summer are unimportant because live leaves are not present during this time of year. Significant photosynthesis can occur in temperatures that are only slightly above freezing. The root system of this orchid benefits from (and may require) a symbiotic relationship with compatible mycorrhizal fungi. Otherwise, this orchid may fail to flourish. It can be slowly propagated by separating its corms to establish new plants. Propagation by seed is very difficult and rarely successful. A moist to mesic loamy soil with abundant organic material is preferred. Soil pH can vary from mildly acidic to neutral. 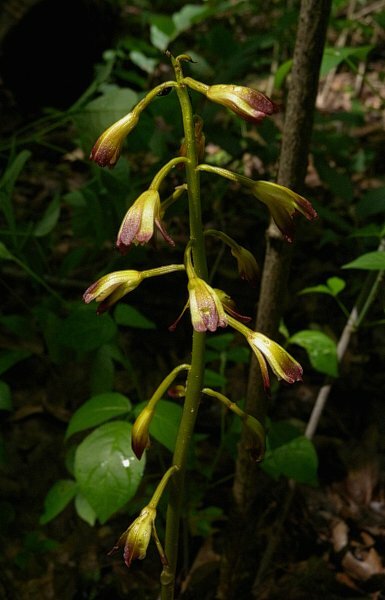 Range & Habitat: The native Putty-Root Orchid is occasional toward the southern tip of Illinois, while in the rest of the state it is uncommon or absent (see Distribution Map). In spite of its lack of abundance, this is one of the more common orchids within the state. Habitats include rich mesic woodlands, wooded areas (e.g., terraces) above streams, damp depressions in upland rocky woodlands, the bottoms of sandstone canyons, areas near the bases of wooded slopes, and the bottoms or lower slopes of ravines. The Putty-Root Orchid is specifically adapted to deciduous woodlands where such canopy trees as Sugar Maple (Acer saccharum) and American Beech (Fagus grandifolia) are present. It is found in above average to high quality natural areas. 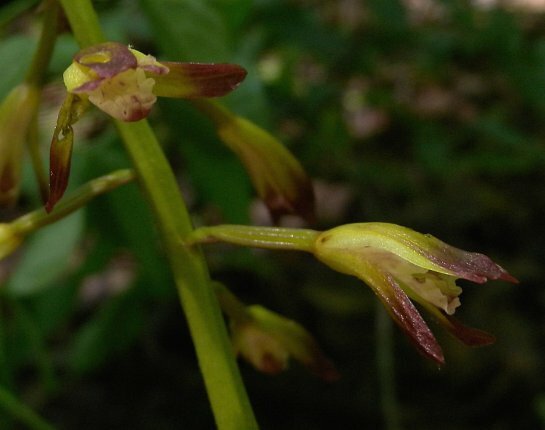 Such invasive species as Garlic Mustard (Alliaria petiolata) and Japanese Stiltgrass (Microstegium vimineum) present a significant threat to maintaining populations of this orchid within the state should they continue to spread. Faunal Associations: Various bees are likely pollinators of this orchid. A Halictid bee, Lasioglossum oblongum, has been observed visiting the flowers. Such insects are lured to this orchid's flowers by deception, as no nectar is present to reward such floral visitors. There is a potential risk of White-tailed Deer browsing on the flowering stalks and basal leaves, but more specific information about this is currently unavailable. Photographic Location: A hilly woodland in east-central Illinois; the photographed orchid was located at the base of a wooded slope on a terrace above a stream. Comments: The flowers of this orchid are reasonably attractive, although their muted colors can make them difficult to spot in a woodland. The basal leaf is also attractive, which persists during the winter while disappearing during the summer! This odd characteristic takes advantage of the greater amount of light that is available when deciduous trees are leafless. In the past, a mucilaginous substance was obtained from the bulb-like corms that could be used to repair pottery and crockery, hence the name 'Putty-Root.' Another common name of this orchid is 'Adam-and-Eve,' which refers to the pair of corms that are connected together by a slender rhizome in the root system. The range of the Putty-Root Orchid partially overlaps a similar species, the Cranefly Orchid (Tipularia discolor), and it is possible to confuse these two species. The flowers of Putty-Root Orchid lack nectar spurs, while the flowers of Cranefly Orchid have nectar spurs that are long and slender. The racemes of the latter orchid tend to have more flowers (12-30) and these flowers are more white than those of the Putty-Root Orchid. There are also differences in the appearance of their basal leaves. The basal leaf of Putty-Root Orchid has white veins on a dark green background, while the basal leaf of Cranefly Orchid lacks white veins. The basal leaf of this latter orchid is also shaped differently (a little shorter and more wide) and its underside is usually a deeper shade of purple.